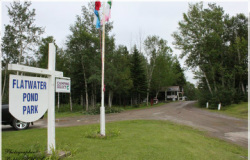 Both serviced and unserviced campsites are available at this former provincial park. Facilities for both trailers and tents are available, and amenities include showers, playground and a convenience store. Activities featured include boat rentals, sandy beach and paintball facilities.